Final Score - Blu-ray Review - ReDVDit! Final Score is a 2018 British action thriller film that was directed by Scott Mann and written by David T. Lynch and Keith Lynch, starring Dave Bautista (who previously worked with Mann in “Heist”), Ray Stevenson, and Pierce Brosnan. Centralizing itself around brothers Dimitri and Arkady Belav, as they have lead the revolution in a Russia state of Sakovya for independence. The revolution ultimately leads with the disturbance until Dimitri was killed in an airstrike and Arkady was subsequently captured, ending the revolution. For several years, Arkady and his men believe that Dimitri had faked his death and that they had tortured a man for his whereabouts, where he had gone into hiding in London. 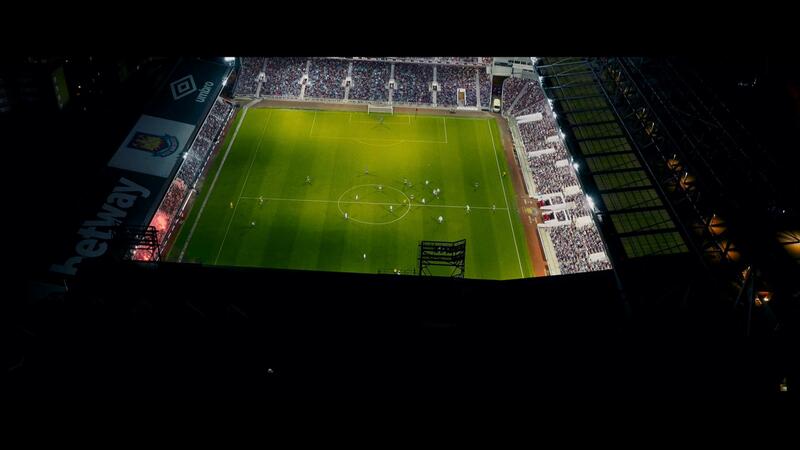 The film was first announced in February 2016, represented as “”Die Hard” in a football stadium”, written by The Lynch Brothers, to be produced by Signature Films and The Fyzz Facility, with Highland Films Group executive producing with a $20 Million operating budget, filmed at the Boleyn Ground, former home of West Ham United. 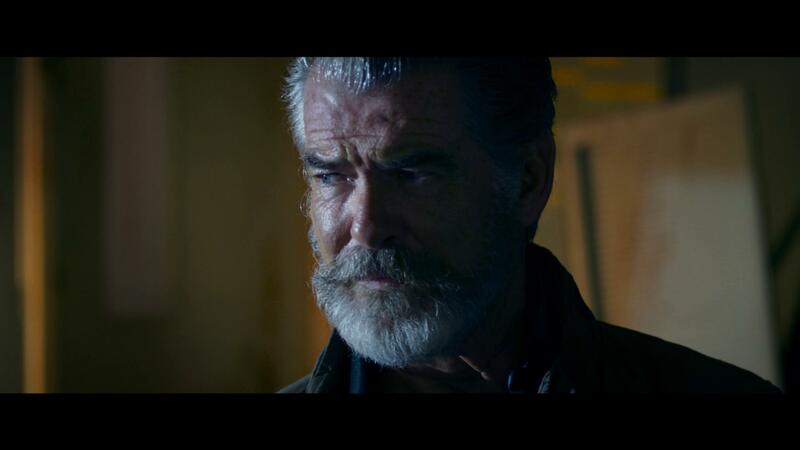 In July 2016, Dave Bautista and Pierce Brosnan were announced to be headlining the cast, which also include Julian Cheung, Russell Phillips, and Alexandra Dinu, with director Scott Mann at the helm, scheduled to begin filming on August 8, 2016 at the stadium. Principal photography officially began on August 15, 2016. In June 2018, a teaser trailer was released by Sky Cinema, along with an announcement that the film would open in the UK and Ireland on September 7, 2018. 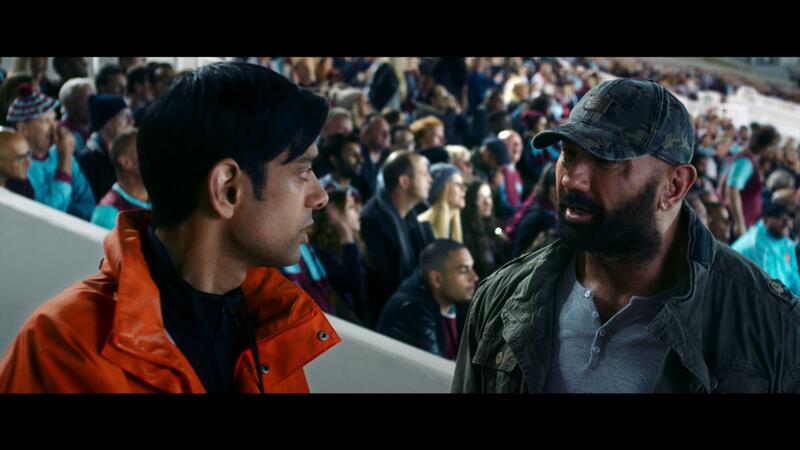 The film released in cinemas and on the Sky Cinema subscription television service on the same day. Final Score is a movie, that really tries its hardest to match up to the similar talent and experience that had been presented in the 1995 action film, Sudden Death. 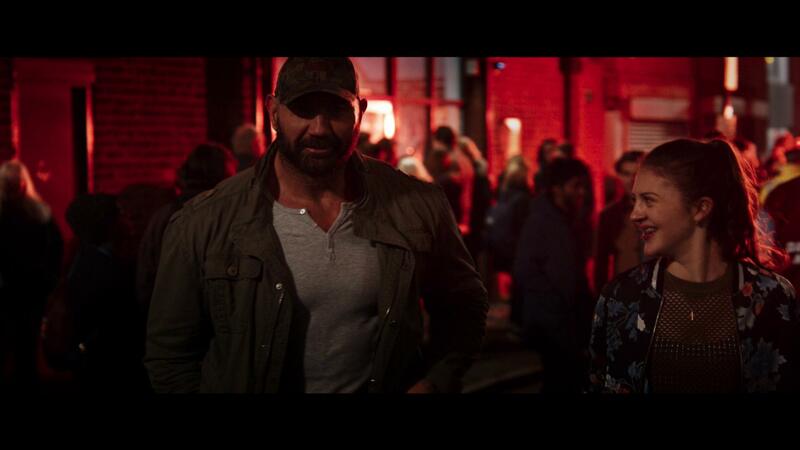 Unfortunately, with Dave Bautista’s lack of charisma and personality, it fails to deliver upon that goal. Possibly being the least politically inspired terrorist feature, there’s at least a few moments of jokes and hilarity among the characters that make the experience with this movie one of the better popcorn features that have come out in recent times. There really isn’t much that stands out with this film, outside of the fact that it’s just another notch in Bautista’s action-hero career. Honestly speaking, I think Bautista needs a pretty crazy action thriller that goes over the top to really escalate his career in this genre to really make him stand out and help to separate him from his character in the Guardians of the Galaxy films. The overall visual presentation that comes with the Blu-ray release of Final Score was pretty solid, and really helped with the conveyance of the storyline and the edge-gripping aspects of the plot as it aided in accompaniment to the rather bland performances. There were a handful of scenes that could have used more ambient lighting to make things appear visually cleaner; however, overall it wasn’t too terrible and didn’t really distract from the overall experience. If I were to pick a series of events that stood out more than others, I would definitely have to go with the inner-stadium action sequences with the dirt bike (trying to avoid some spoilers here). Other than that, there really weren’t any parts that stood out more than others. A release that should have been packaged with a 7.1 mix, Final Score ultimately comes bundled with a DTS-HD Master Audio 5.1 mix. While the presence is considerably powerful, especially in the lower frequencies and the bass tones, this release would have simply done better had they opted to go with the inclusion of the surround channels at a minimum. Despite its lack of immersion, like I had mentioned, the audio is considerably powerful and really fills the room with its sheer power. The dialogue is spoken cleanly ensuring that everybody is able to be heard and understood without the need to manually adjust the volume levels at all. 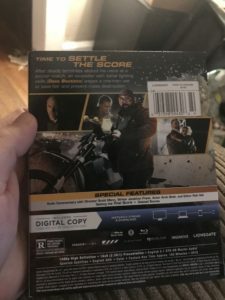 The Blu-ray release of Final Score comes packaged in your standard single-disc Blu-ray amaray case. Within that case is the standard Blu-ray copy of the movie, the disc featuring the same artwork that’s been included on the case. There are no DVD copies of the movie included with this release; however, there is a digital copy redemption pamphlet that’s been included for the various streaming platforms as well as a slipcover that’s been made available in the original pressing of the release that features the same artwork that’s been included on the case. Overall, I found Final Score to be an “okay” popcorn experience that really lacked originality as Bautista is really trying too much to be like Jean Claude Van Damme in this movie. With its differences upon the Sudden Death storyline, and Bautista’s lack of personality, I had some trouble really finding myself enveloped with this release. It wasn’t a complete disaster, however it wasn’t really anything noteworthy. The presentation of the Blu-ray release were really nicely done, despite the few instances where some extra lighting was needed and the lack of immersion with the audio track. There’s a good chunk of special features that shares some of the work that went into the movie. If you’re considering this release for your collection, I’d recommend waiting for it to go on sale and be below the $10 mark. 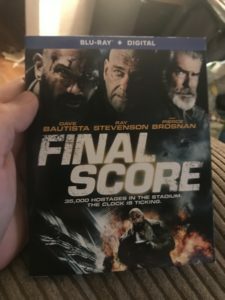 Final Score was released onto Blu-ray and DVD today.